Oh. Hello. Welcome back. We're doing this again. Get excited. We're almost certainly in for a weird season here in Arsenal Land. We'll have the Europa League to occupy our Thursdays, with many more Sunday league matches thrown in because of that. The drawing for the group stage is August 25, where we'll find out if we have to travel to the likes of Zorya Luhansk or Sūduva Marijampolė or Gànipten Fanúpt. Okay, I made up that last one. But we start with the FA Community Giant Serving Platter against our old friends from West London. The Blues reloaded this summer, like they always do, spending a combined GDP of Liechtenstein on new players to replace a handful of departures. Also, John Terry's at Aston Villa now. Still, football's back! Let's do this! The FA Community Shield (formerly the Charity Shield) has been played since 1908. It was called the Charity Shield until 2002 when the Charity Commission declared that it could no longer be legally called that, after the FA failed to specify what money from ticket sales went to charity. Whoops. The match is, of course, 90 minutes, but if it is drawn, it will go straight to a penalty shootout without extra time. Clubs are allowed to make up to six substitutions instead of three. Yellow cards picked up will not accumulate towards a player's total for the season, but a red card will incur the appropriate one- or three-match ban. Laurent Koscielny is still in the midst of serving a three-match ban for a sending off from the final league game of last season, though the suspension does not affect this match. He missed the FA Cup Final last year and will miss the first two league games of this season, but he is available on Sunday. Gabriel is slowly returning to training after he injured knee ligaments in last year's Premier League finale; he's likely still three weeks or so away from a return. Jack Wilshere, who broke his leg while on loan with Bournemouth last season, has not yet returned to full training. Ditto Santi Cazorla, who has been out since the fall with a variety of problems. Francis Coquelin injured his ankle in the Emirates Cup against Benfica last weekend; he's unavailable here. There are doubts over Aaron Ramsey and Mesut Özil, who both missed an open training session with knocks, but both should be available for selection. Predicted XI: Čech, Monreal, Koscielny, Holding, Kolašinac, Bellerín, Xhaka, Ramsey, Özil, Walcott, Lacazette. I feel like whenever Arsenal plays Chelsea, the Blues have zero injuries and all I'm left to talk about in this section is how insane that is. However, Chelsea are expected to be without Eden Hazard, Pedro, and new signing Tiemoué Bakayoko for this one. Pedro is back in training with a large face mask, so it might turn out that he's available anyway. Other new signing Álvaro Morata might be lacking match fitness as well and could be a doubt, though with Chelsea's other injuries up front, he might have to come into the XI. The same doubt status goes for Antonio Rüdiger who, like Mustafi, won the Confederations Cup with Germany. Bakayoko, a defensive midfielder purchased from Monaco because European clubs always sell their players to other clubs before Arsenal are able to get the player they want from them, is expected to replace Nemanja Matić, who completed his move to Manchester United on Monday. Morata will replace Diego Costa, who has supposedly turned in a formal transfer request. Predicted XI: Courtois, Cahill, Luiz, Azpilicueta, Fàbregas, Kanté, Alonso, Moses, Willian, Morata, Batshuayi. Arsenal's preseason to date has included four wins and two losses. The club started their preseason tour in Sydney, Australia, where they defeated Sydney FC 2-0 and Western Sydney Wanderers 3-1. No word on any matches against Northeastern Sydney Albion or Real South Central Sydney. From there, Arsenal traveled to China to take part in the International Champions Cup Annual Money Grab Extravaganza, in which they came from behind to defeat Bayern Munich on penalties, but then lost 3-0 to Chelsea. Then, it was back to London for the Emirates Cup, where they had a swashbuckling win over Benfica followed by a whatever-the-opposite-of-swashbuckling-is loss to Sevilla. Arsenal still won the Emirates Cup anyway, because goals scored count as points for some reason. Chelsea's official preseason schedule included only three matches, starting with their aforementioned win over Arsenal. They followed that, however, with losses to Bayern Munich and Inter Milan. 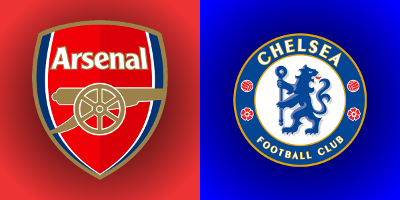 Arsenal are in this match thanks to their FA Cup win over Chelsea to end last season. Alexis Sánchez opened the scoring early with a controversial goal in the fourth minute. Chelsea were reduced to 10-men on 68 minutes when a Victor Moses dive in the box was rewarded with a second yellow card. Even shorthanded, Chelsea had an equalizer through Diego Costa on 76 minutes, but Aaron Ramsey gave Arsenal his second FA Cup winning goal in four years just three minutes later. Both sides split their league meetings last season. Arsenal ran riot over Chelsea at the Emirates last September, jumping out to a huge lead, with Alexis Sánchez pouncing on a Gary Cahill error in the 11th minute before Theo Walcott doubled the lead three minutes later. Mesut Özil added a third before halftime and Arsenal coasted to a 3-0 win. This will be Arsenal's 22nd Charity/Community Shield match; the Gunners have won the glorified friendly on 14 previous occasions, though that number includes one year, 1991, in which they shared the trophy with Tottenham Hotspur. Ewww. That was the last occasion of a shared title; penalty shootouts were introduced in 1993. Arsenal's other wins in the competition came in 1930, 1931, 1933, 1934, 1938, 1948, 1953, 1998, 1999, 2002, 2004, 2014, and 2015. Arsenal lost the match in 1935, 1936, 1979, 1989, 1993, 2003, and 2005. Chelsea are making their 12th appearance in the FA's curtain-raising event. The Blues won the Shield in 1955, 2000, 2005, and 2009. Their losses came in 1970, 1997, 2006, 2007, 2010, 2012, and 2015. The sides have met in this curtain-raising match on two previous occasions, with both sides winning once. The 2005 meeting between these two sides ended 2-1 to the Blues, with Didier Drogba scoring twice at the Millennium Stadium in Cardiff. Current Chelsea midfielder Cesc Fàbregas had Arsenal's consolation goal, while current Arsenal goalkeeper Petr Čech made six saves in the win. In 2015, Alex Oxlade-Chamberlain's thunderbolt was the only goal in a 1-0 Arsenal win. For Chelsea, Madley took charge of three wins and a loss last season. The wins came over Leicester City, Everton, and Stoke City by a combined scoreline of 13-4. The loss came 2-0 at Old Trafford in mid-April. Madley, who will be 32 in October, has been refereeing at the top level since 2013 and was promoted to the FIFA list in January of 2016. Madley has the distinction of showing three red cards in his first ever Premier League match, which is pretty ballsy; all three were widely deemed to have been correct. John Painting is a contributing writer to the Modern Gooner and a crap polyglot. You can follow him on Twitter @zorrocat muy bien, gracias.